Given the following information, which of these people do you think is more likely to contract Eczema, a skin disease affecting primarily children, featuring rashes of dry, itchy, and scaly skin? Chad lives in a developed country (the United States) in the swanky section of a bustling city (Park Slope, Brooklyn, New York) His parents are wealthy and upper class, and his mother was 35 years old when she gave birth to Chad. Chad’s parents make sure that he is always clean and well-cared for. Rami is not named Chad, but he does live there, one of the poorer nations on Earth. His family is poor even by Chad (the country) standards and is, socioeconomically speaking, lower class. They cannot afford to live in a city, instead living on a small farm where they have two animals, a dog, and a goat. They drink the goat’s milk. Rami’s mother was 15 when she gave birth to him. They cannot afford to keep him clean or give him adequate medical care. Obviously, you would say Rami is more at risk for Eczema. Rami is poor and doesn’t have access to Chad’s standard of medical care, his parents can’t afford to keep him as clean as Chad’s parents do, and he’s obviously more at risk of disease and infection. On top of his poverty, he lives in an undeveloped nation, putting him more at risk. Living around animals probably doesn’t help, and neither does drinking unpasteurized milk. Not to mention the fact that Rami’s mother had him as a teenager probably means that Rami’s even more at a disadvantage, having a mother who may not be as equipped to properly take care of him. In fact, however, Rami is much, much less likely to develop eczema. Every single detail of Chad’s situation is actually correlated with higher incidence of eczema: Living in a city, in the developed world, in a high social class, with an older than average mother and a high standard of hygiene is in fact linked to increased incidence of eczema. And, on the other hand, every detail of Rami’s case is linked with a lower incidence of eczema: living in an undeveloped country, in a lower social class, with lower standards of hygiene, around animals, drinking unpasteurized milk, and with a younger than average mother are all in fact linked with lower incidence of eczema. Chad may have a better life than Rami in innumerable ways, but he’s more likely to have eczema than Rami. This is all quite counter-intuitive and puzzling. Generally, better living conditions make you more at risk of eczema? What it does mean, first of all, is that eczema is not a bacterial or viral disease that can spread in unhygienic conditions, because unhygienic conditions actually make it less likely. Secondly, and more importantly, it means that environmental factors play a large role in eczema, those factors being the stuff we enumerated: Better living conditions, better hygiene, and maybe exposure to animals and milk and the age of the mother. Why those particular factors are the ones triggering eczema is poorly understood. It is hypothesized that in our hygienic and clean societies, our children aren’t exposed to certain allergens, don’t develop a resistance, and are thus vulnerable later on to the sorts of allergic reactions that cause the rashes that constitute eczema. This may or may not be true, and should not cause you to forsake hygiene for your child (Chad may have more risk for eczema, but Rami has a higher risk for West Nile Virus). It’s not just environmental factors, though. Genetics also seem to play a large role. Firstly, If a child’s parent had eczema as a kid, the kid is much more likely to get eczema as well. But not just that. A family history of Asthma or Hay Fever also seems to correlate highly with risk of eczema. All of these facts, taken together, give us an idea of what eczema is and what it isn’t. It is not a bacterial or viral disease, it is not contagious, and it is not the result of a lack of hygiene or poor living conditions (if anything, just the opposite). Rather, it’s a condition caused by environmental and genetic factors interacting in ways we don’t quite understand to produce a certain set of symptoms. Those symptoms manifest differently for different age groups. As we have mentioned, eczema primarily affects children. Between 10 and 20 percent of children get eczema, compared to 1-3% of adults. 90% of cases occur before the 5th birthday. Infants (defined for our purposes as ages 0-2) often get eczema around 2-3 months old and break out in dry, scaly rashes on their scalp, forehead, or face, especially the cheeks. Because infants do not have the ability to verbally express how itchy they feel, a telltale sign of eczema may be the infant in question rubbing itself against bedding or carpeting, trying to scratch themselves, which you might find adorable for half a second before realizing your infant is doing that because they’re in pain. They also might have trouble sleeping, which makes sense; you’d have trouble sleeping too if you had an itchy rash and no fine motor skills. These rashes may bubble up and ooze or weep fluid or can become infected because of aforementioned rubbing and scratching. Children (from ages 2 and up until puberty) have different symptoms than infants. Their dry, itchy, and scaly rashes appear mostly in the creases of the elbows and knees, the creases between the legs and buttocks, neck, wrists, or ankles. In time, these rashes can become bumpy looking (like permanent goose bumps), lighten or darken, thicken in response to constant scratching and develop knots. They can even become itchier over time. Adults, who, to reiterate, make up a tiny fraction of eczema cases, manifests as very dry, very scaly (scalier than children’s eczema) rashes that appears in the creases of the elbows or knees, the nape of the neck, or just all over the body, and can be especially noticeable around the face, particularly near the eyes. It can itch non-stop, can thicken, and can become infected. What do you do about eczema? 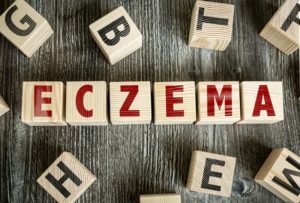 As we have mentioned, eczema is a condition that results from a certain set of environmental and genetic factors that interact in ways that are still poorly understood. That means that unlike other skin diseases, where we can try and get rid of the thing that causes the disease, whether it’s a bacteria or a virus or oil build up or what have you, with eczema, we don’t have that option, because changing one’s genetic makeup is still considered unethical and changing their entire living circumstances is impractical. So when treating eczema, we don’t so much address the causes of the symptoms than the symptoms themselves. There’s one exception to this, which is allergic reactions. Skin reactions to allergens and eczema are very similar. You might even say that eczema is best defined as “the skin’s allergic reaction to something we don’t know about”. So the first response to a case of eczema, particularly if it’s in an adult, is to try and figure out whether it’s eczema or just an allergic reaction. People have allergic reactions to all sorts of things; certain laundry detergents, gold jewelry, fake jewelry, certain fragrances. If the rash only appears in a certain area touched by something that might be an allergen, try removing the allergen from the equation. That would be the easiest and most straightforward way of dealing with the problem. To get rid of the rash, and reduce dryness and itchiness, use moisturizer. Which moisturizer? Pick one. Just go down the aisle at your local pharmacy and pick one. Different brands work best for different people, and some trial and error may be necessary for determining which brand is best for you or your child. For a cheaper and fragrance-free option, consider using petroleum jelly. Apply the moisturizer at least twice a day, or when you or your child’s skin seems dry. To prevent infection, really try your best to keep from scratching. When you scratch, you create holes in your skin that bacteria can get inside of, particularly when your skin is damaged as it is. This is a hard job for adults, to say nothing of children, so with children, some tricks may be necessary. Make sure their fingernails are short and smooth, to limit scratch damage. At night, putting cotton gloves on your child may prevent them from scratching during sleep. The good thing is, eczema usually goes away on its own, even if it can be frustrating and painful while it’s present. If it’s any comfort, bear in mind that if you or your child has eczema, because of the environmental factors we mentioned at the beginning of this article, your life is in all likelihood pretty good in all the other areas besides “not having a dry, itchy, scaly rash”.